Wind Power has a New Weather Center! The Wind Power web site has a New Weather Center! On Monday June 20 the New Weather Center was added to the Wind Power Web site. 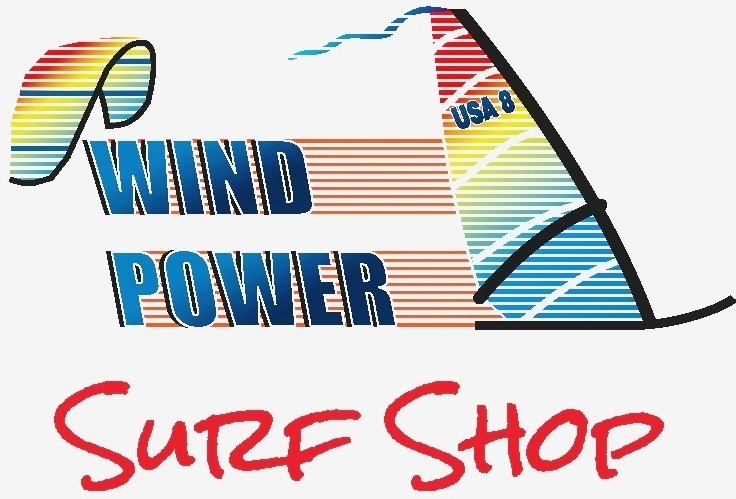 The Site has it’s own URL at WindPowerWeather.com . A Weather Center link is available on Wind Power home page and under Information pull-down menu. As you can see in the picture above the Wind Sensor is mounted much higher than in the past. It will give a more realistic reading in more directions due to the added height. 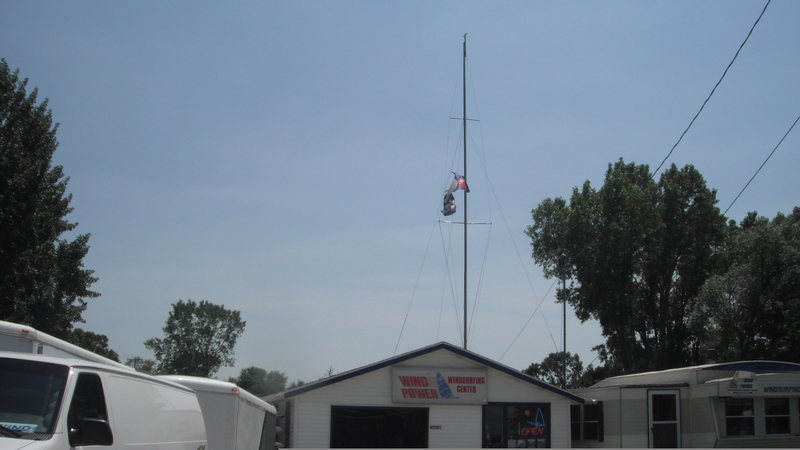 My brother Andy donated an A-Scow mast which we put on top of the shop. The Wind Sensor is on top of it which should put it at 60 plus feet. This is around the height of the neighboring trees. But that is not all that the Weather Center is about. It has a very detailed graphs of the wind speed with gusts, direction and speed, temperature and wind chill. There is also a tabular data. Forecast are available from several popular weather links. Water Temperature is also available. There are graphs with a detailed history of the past weather. Personally I like to see the peak gusts. The Weather Center is dedicated to Stellablue, a longtime companion of the developer of this site. Stellablue was a yellow Labrador retriever and learned to windsurf as a puppy and loved cruising on the long-board. As you can see in the photo, she was ready to go, but was not much help up-hauling the sail. The Weather Center is dedicated to her memory. The Weather Center was many hours in development and deciphering data find what would work best for Wind Power. Some of the unique features are the recommended Launch Sites and desktop gadget (for Windows). The Weather Center not only provides weather data, but provides a lot of explanations and educational information. Check out the Information and Sensor pages for example. We are excited to bring this new service and it’s features to you. Feel free to blog back or contact us with any comments and suggestions. 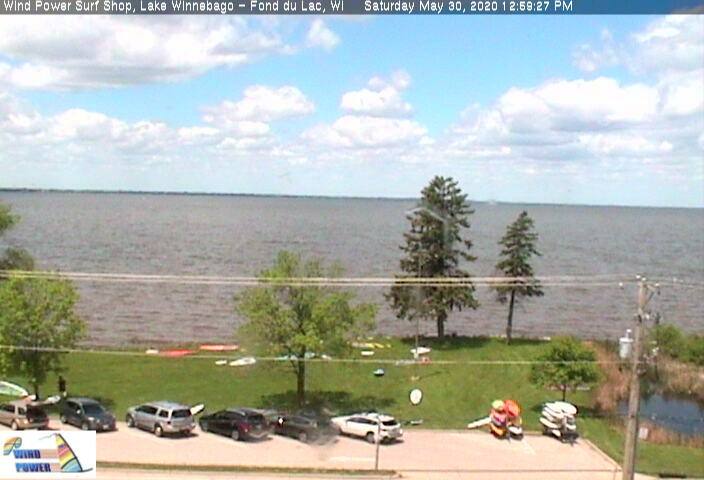 Enjoy the weather Center and make the most of it to increase you fun in the WIND on Lake Winnebago. Why would I attend a Regatta or an Event? I can think of many reasons to attend a Regatta, a Windsurfing, Kiting, or sailing event. No.1 It’s a party! A get-together with friends that enjoy the same sports you do. 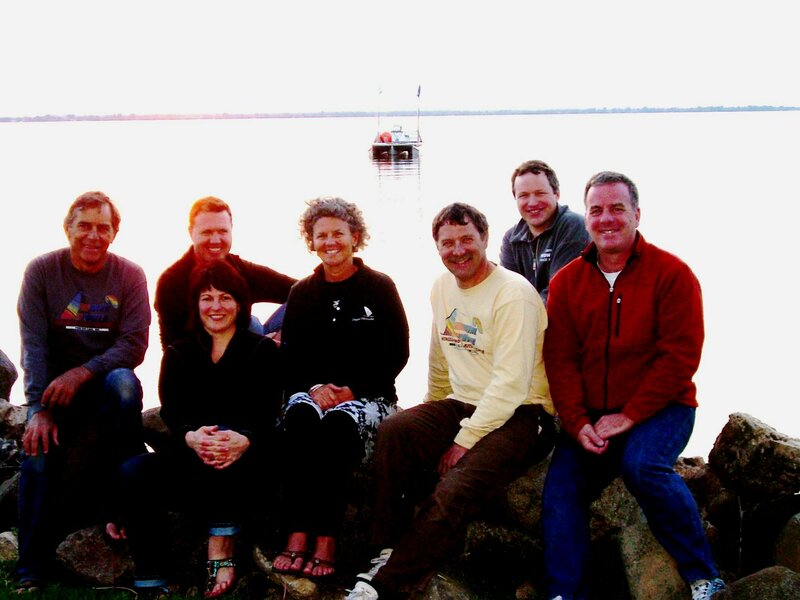 Everyone likes to have others around them to kite, windsurf or sail with when they are enjoying their sport. You have to admit it’s more fun when there are others to watch and hoot, holler and encourage when doing your sport. Most people find the social aspect of the sport a big part of the sport and a boost to the fun factor. You meet new friends that enjoy the same thrills you do. At work your fellow workers are probably sick of listening to you babble about how much fun you had in the wind. Why, they hate the wind, for it makes their sports harder or impossible. They don’t understand your psych, nor do they want to. When you get to the beach it’s a whole different story. Everyone wants to hear you story and share theirs. So go and party with those who enjoy those who enjoy your sport. No. 2 It’s a great way to learn and improve! For those new to the sport, they can hang with those experienced and learn from them. Most of the those I have meet are more than willing to share and HELP those who are learning. Remember all of us were Beginners at one time and we don’t forget those days. We want to help beginners get through the tough times as fast as possible and enjoy the sport at a higher level. I have personally watch and experienced everyone who competes improve a much greater rate than those who fine every excuse to not compete. How many have said they are not competitive but when you see them on the water they are trying to out do others. Jumping higher, going faster, or doing harder or more tricks. Those sailors should be honest to themselves and join the FUN. No.3 It’s Fun Competition! It’s fun to compare yourself to others. Getting the jitters on the starting line is exciting. Where else do you get a rush like that? It’s great fun to be next to your friends pushing eachother to do your best. You will find you push yourself harder than when you are alone. I enjoy cheering others on and hooting it up. It will promote you to pay more attention to techniques, equipment setup and tuning, tactics and weather. No.4 Help Promote your great sport! Having a Competition bring a bigger group than normal and showcases our sport. It entices and creates interest in those who watch to join the fun. How can one not help wanting to participate in a sport where everyone is having so much fun.We all want to share our enjoyment of our great sport and help it grow. So we have more friends to Party with! No.5 Don’t be a Party Pooper! If you enjoy Competitions and would like to see more of them as well as see the existing ones grow to higher levels, you must attend. Not attending an event because of lack of wind is the most common excuse. Forecast are often wrong, weather always changes. Wind can come out of no-where. That mentality is the quickest and sure way to kill a Competition or Event. Think of the big picture of the makings of an Event. You must have a race organizer, support personnel and sponsorship of some kind. A lot of behind the scene work goes on. Not attending because the forecast does not look good puts all their work in vain. The sponsors do not see a return for their investment, therefore they pull out. Soon the event is history. So remember instead of contacting your friends and telling them you are not going to make the Event because of a poor forecast. Contact all you’re friends and tell them to come and join you at the Party! 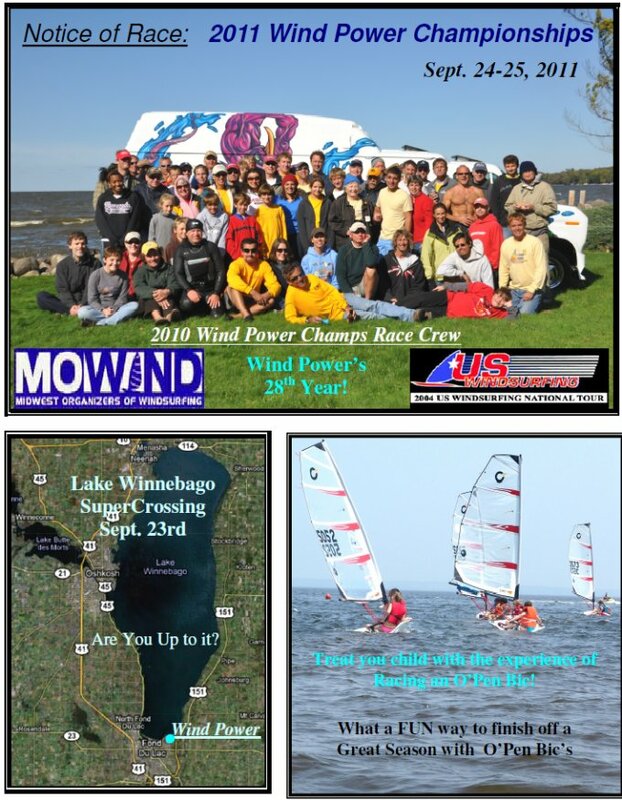 This was the 25th Annual Wind Power Championships on the south end of Windy Lake Winnebago. The weather forecast had light wind for Sat. afternoon and Sunday, but the wind Gods were with us and we had great conditions. 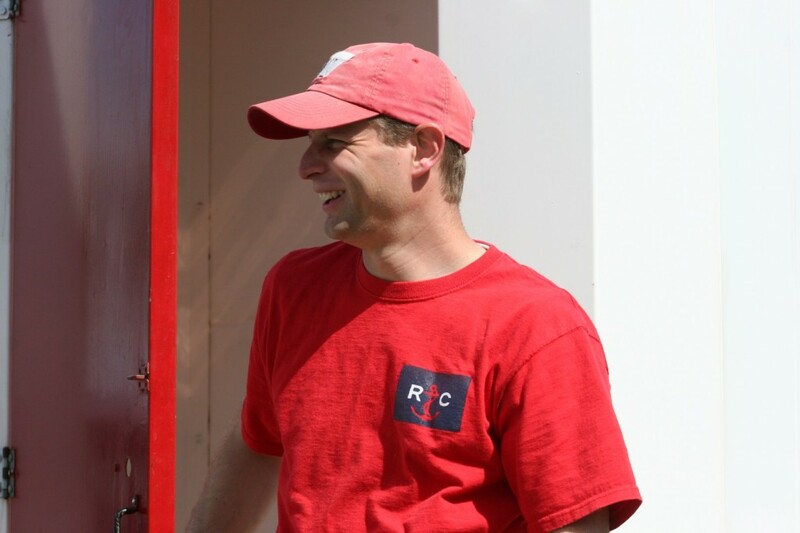 Regattas are a fun time when Windsurfers get together, attendance based on wind conditions can often leave one wishing they had attended as was the case at this event. Go to a regatta to hang with a great bunch of sailors, get out of the rut, improve your abilities, have fun while learning from others. Racers always get the most out of the wind. Wind Power was honored to have racers attend from out of state: TBay Ray from Thunder Bay Canada, ,Joe Boersma and his son Mark from Mich., Jeff Deganor Mich,, Niles Book from the UP, Tom Stokes from Ind., Larry Reed, Randy Howell. Friedehlm and Steve Calloway from Ia., Robin Shaw brought his Monster Van all the way from Ia., The Johnson family of 4, Adam Anderson, Jerry B and Peter H from Mn., The Mike Reed family, Mic Igoe and his mother Jean, Steve Willits, Alex Monroe and his new wife all from IL. And not least, all those fun racers from Wisconsin. 54 racers in all, 27 in the A-Fleet, 18 in the Sport Fleet and 9 in the Workshop Fleet were treated to the wind left over from Friday. Figure 8 Slalom racing was setup right off the beach for Sat. morning. The wind was forecasted to become light in the afternoon and hold for the rest of the weekend. Some tried using shortboards or Formula boards others used their longboards and there was very exciting racing with a lot of action at the jibes. Every race Saturday had a different winner in the A-Fleet, Jim Magnuson won 2 slalom races in the Sport Fleet and Andrea Gratton dominated the Workshop Fleet. After 3 races of slalom and a short lunch break the racers were treated to the World Famous M Course (see image below). The M Course has 5 jibes in a row and that can be challenging. A Course race should be a test of sailing in all points of sail and the M course does it the best. The A-Fleet did an extra windward/leeward. The afternoon course race had the wind die as predicted and the second race was cancelled. Everyone got ready for the evening meal and MoWind Year End Awards at the Sunset Supper Club next door to the race site. After a free drink on the SunSet Supper Club a great meal of pasta, chicken, salmon or prime rib followed. Arden Anderson and Don Altmeyer handed out this years MoWind Awards. Don picked out a nice navy blue windbreaker with the MoWind logo and 2010 Race Series printed on it. Go to the MoWind web site; www.mowind.org. to see the 2010 year end results and class winners. The famous bonfire followed and as the evening got late the wind started to build. Those who were last at the fire were hoping the wind would hold for Sunday racing. Sunday mornings 9:30skippers meeting had light wind. 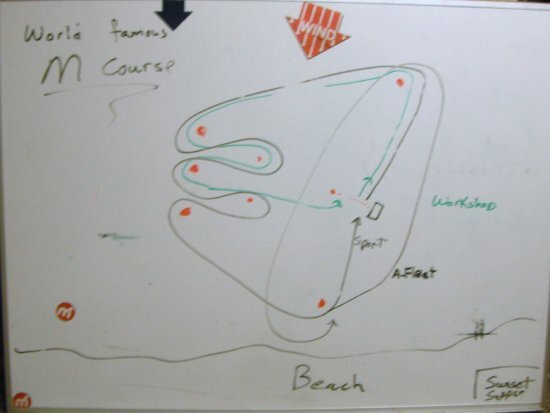 Again the World Famous M Course was set. Racing was fun with the A-Fleet and Sport Fleet starting together. A total of 45 at the start meant for some interesting jocking for position especially in the last minuet to the start. A good position at the start was important to get clean wind for the upwind race to the first buoy. During the first race the wind started to build. By the start of the second race you could almost plane and smiles were everywhere on the race course. Races 6, 7, 8 and 9 had planning conditions which lead to a lot of excitement on the course. Some racers were jibing out of control, either from the challenge of their equipment or their ability for the wind strength. Carnage at the jibe marks can attest to that. A few of the starts had some big crashes with 5 or 6 racers in a pile. There was even a high speed collision at the windward mark on the last race resulting in a big hole in the bottom of a sail. Even with all the action and crashing everyone had a blast. Everyone was smiling and tired when they returned to the beach after 5 races. Sunday was some of the best conditions for course racing at any MoWind event this year. A footlong Sub for lunch was followed with the Year End MoWind raffle that Peter Hartwitch so graciously ran. Neils Zaunmueller won the grand prize a KA Sail, Tom Stokes, Del Carpenter and Phil Barhouse each won a GPS, and the Windtronics Wind Meter went to Jeff Adamski. Awards and door prizes were handed out for the wrap up of another great Wind Power Championships. Kevin would like to thank all of those who took time from their busy schedules to attend. Most importantly he would like to thank those who helped make the event run smoothly. Ann Gratton race director, Greg Liefer and Leah Altmeyer race committee, Peggy Wing for her excellent photography all weekend (next year she is racing), Mary Davies for registration and running the shop, Jennifer Wettstein assisting in the planning and organizing, Mike Bierworth for computer and web site support, My mother, brother Andy, niece Andrea and nephews Rob and Blaise for help in so many ways. Many Kudos to the gracious prize sponsors: NAISH, Maui Sails, Chinook, Aerotech Sails. See you next year, bring your friends and family! Thanks to our sponsors for their support of this event. The Walleye Wagatta has been around since 1987. 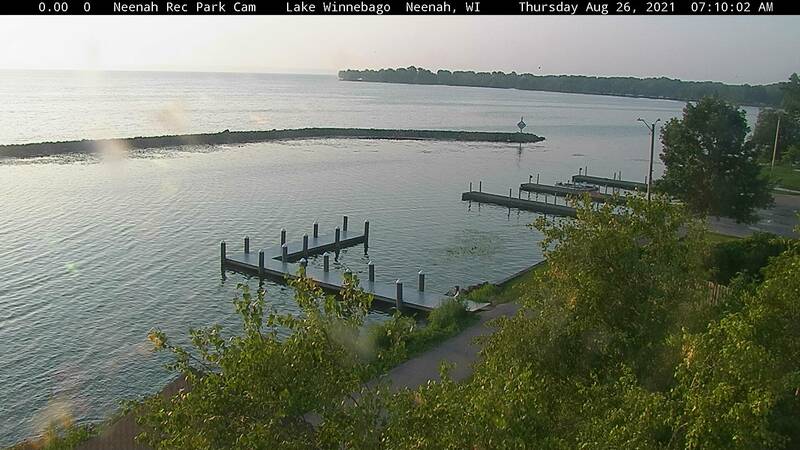 Originally it was run in conjunction with Fond du Lac’s Walleye Weekend (hence the name). Walleye Weekend is a fun Family festival tied in with Mercury’s National walleye tournament held at Lakeside Park in Fond du Lac. Since 1997 the Walleye Wagatta has been held at Roosevelt County Park across the street from Wind Power. Back in the Walleye Weekend days there were up to 100 racers with 3 race courses. 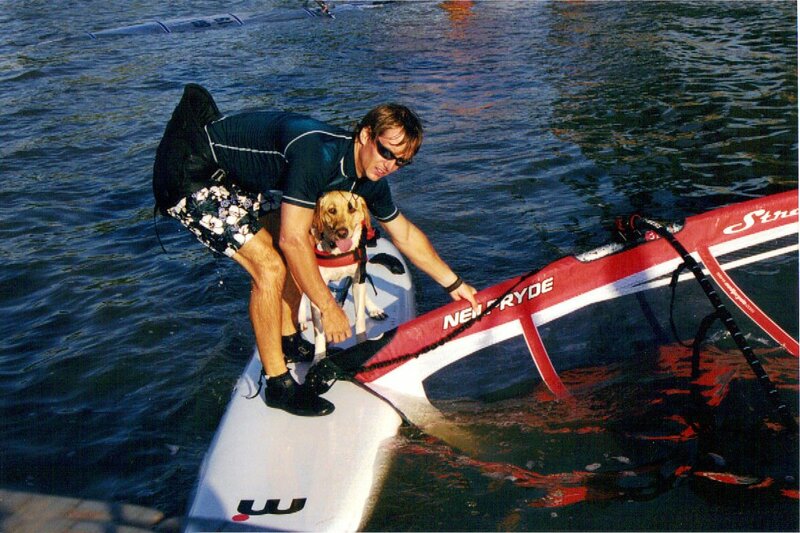 Olympic members from the US and Canada competed along with the US Olympic Windsurfing Coach Major Hall. This year we were happy to have 27 competitors from Ohio, Michigan, Illinois, Missouri, and of course Wisconsin. We were also blessed with the appearance of Tara and Ted Schweitzer, the children of Hoyle Schweitzer the co-inventor of windsurfing. Ted was ripping the course up on a vintage original Windsurfer. Andy and Kevin Gratton joined him on the Waylers they learned how to sail on in the early 80’s. 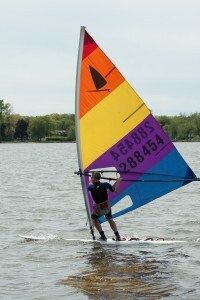 Check out Ted’s web site the original windsurfer. Thanks to Ted you can now buy a brand new original windsurfer! 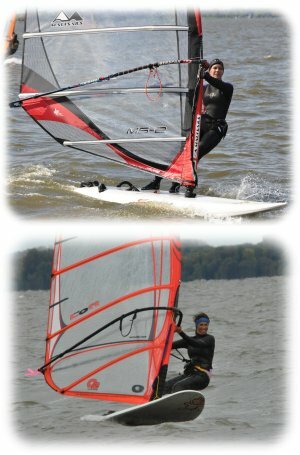 Check out his really cool Original Windsurfer website: http://www.originalwindsurfer.com/ there are some really nice pictures and stories about the birth and growth of our great sport. Arden Anderson E-11 the Race Director of the 2010 Walleye Wagatta hasa synopsis of the race from his perspective posted on the MoWind site. Arden Anderson took over as Race Director the last 2 years and has done a great job. He has also posted some pictures &amp videos which are also on youtube. Check them out!. One of Arden’s goals is to make it a really affordable regatta and pass any profits to the MoWind Association. I believe this year he donated $100 to Mowind! I would like to thank Arden and his family for running the great event, making everyone feel comfortable including those whom it’s their first time. He raced everyone hard yet maintained the huge fun factor. I’m looking forward to working with them next year! There was also a MoWind raffle which brought another $63 to MoWind. Tom Stokes from Indiana is the raffle winner and he will be a finalist for the Final Raffle in Sept. at the Wind Power Champs held again in Fond du Lac, WI. The forecast was for light winds Sat. & Sun. but the wind Gods looked in our favor. We had decent wind for the 3 course races before lunch at which time the wind died to a vacuum. After lunch the wind picked up enough to do some figure 8 slalom in front of the beach. I finally was caught up with my shop duties and had a chance to get out myself. My brother Andy had rigged up a Wayler One-Design (the board we both learned on in the early 80’s) for me and himself. It was the first time on the race course for me in several years after having shoulder problems. Last Dec. I finally bit the bullet and had shoulder replacement surgery. So after months of great therapy at Back-In-Action I was ready to test my new shoulder out. I have to say it works much better and I really enjoyed getting back on the race course. Now sailing on ancient equipment was a relearning experience. The sails don’t pump the same, but needless to say I still had a blast. Ted, Andy and I had a great time in the Vintage Class. For the Slalom races a Bald Eagle sat in a near by tree and watched intently. What an awesome sight for the Eagle and us. Saturday night after supper (many went across the street to the Sunset Supper Club) everyone enjoyed the typical bonfire. Due to late night partying the night before, most packed it in earlier than usual. Fires are important to keep the Wind Gods happy! Sunday racing started around 11:00 am with 10 -12 from the southeast. Arden ran 4 races with the wind building through all 4 races. After starting the 3rd race I was struggling with the Wayler 6.8 sail on 9 foot booms. The gust were getting stronger and more pronounced. Once I got to the upwind buoy the beach was right in front of me and calling. So in I went to rest my shoulder and get out of the starfish stance I perfected when I first learned how to windsurf. (I didn’t want to starfish stance to develop into a habit). In the last 2 races I saw the guys on the bigger sails planning through most of the slalom type course Arden wisely set as an option. So the moral of Sunday was we had great wind from the bonfire, and don’t pay attention to the forecast when a regatta is being held.